Congratulations on your brand new home! If you are like most of us, you have a bunch of foggy ideas on what your home interior should look like, but no real clue how to start. Sounds like you? Then read on for a step by step guide to an interior that is your ‘happy place’. You space that is as beautiful as it is functional, and where everything is in order! There are so many interior design options available in the market today that it’s easy to get overwhelmed! What do you start with? There are no hard and fast rules because it’s your house after all and you must be happy and comfortable in it. But just to get you started on the right foot, do follow the indicative steps below and you won’t go wrong. How many people will be living in your house? Include pets. What are the appliances you need in the kitchen? Do your bedrooms need study areas? Computer points and book storage? Seating? What are your shared family interests? Watching television, of course, and listening to music maybe? Anything else you can think of? Would your wardrobes need more hanging space or shelves for folded clothes? Are you more comfortable with drawers or with shelves in your wardrobes and kitchen? What is your style of entertaining? Are you a religious family? Do you need a dedicated prayer space? Once you have determined what the primary function of each space will be, you can plan for people and purpose, and establish the right floor layout. You should always have an estimated budget in mind, and discuss it with your designer at the outset so that you do not break the bank! Fittings and finishes can be selected keeping your overall finances in mind. Do keep in mind, though, that it’s never a good idea to compromise on the quality of your interior in order to cut costs. You can always add on items later, but don’t choose items that are cheap just because you can’t afford everything of good quality now. Go for just the basics like the bed and dining table. Add on console tables and other extras when you have saved up for them. Always choose quality over quantity in your interior! Define the style that you would like to have in your home. Classical styles are comfortable and fussy, while modern styles are clean cut and sleek. Every element of your design — the choice of furniture, finishes, colours, lighting — depends on the theme that runs through all your spaces. Have a clear idea of the colours you would like in each room. 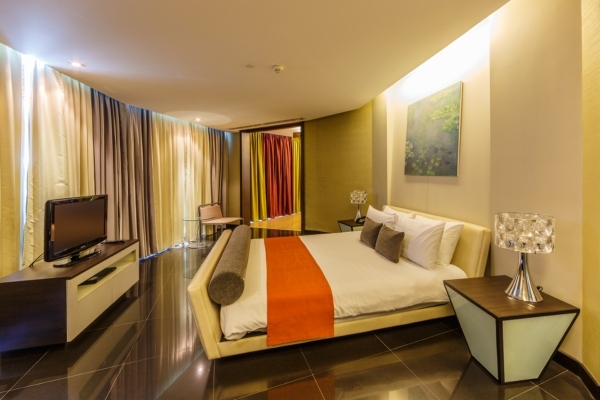 This is an example of a colour palette in a contemporary theme that has been designed around oranges and browns, and works well bedroom that is on the masculine side. The direction and position of windows in a room has an impact on the natural light that comes into the room. If you are in the northern hemisphere, rooms facing south are likely to be full of light (and vice versa). If there is an area you have earmarked as a reading nook, does it have adequate natural light? If not, then you must ensure that there is an electric point there where you can plug in a reading lamp. A suitable overhead lamp that can give you the light you need will also work. 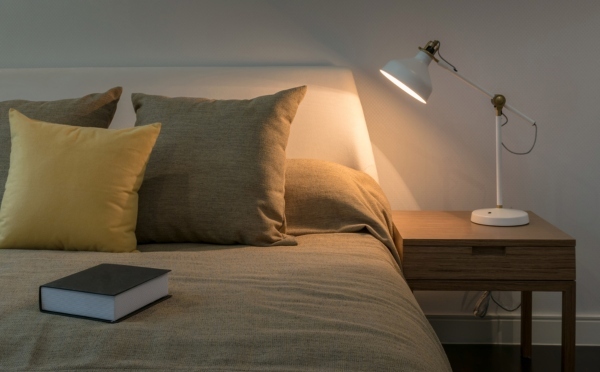 If you like to read in bed, a bedside lamp is a must. Besides a ceiling light that gives uniform lighting, the kitchen could also have cabinet lights throwing light on the countertop. If you would like soft spotlights offering ambient lighting in the living room, then plan for a false ceiling. Lighting plays an important role in your décor, and with the right lighting, you can completely redefine the moods created in any space. Once you know how the layout of your room should be, check to see if the electrical points you need are in the right places. 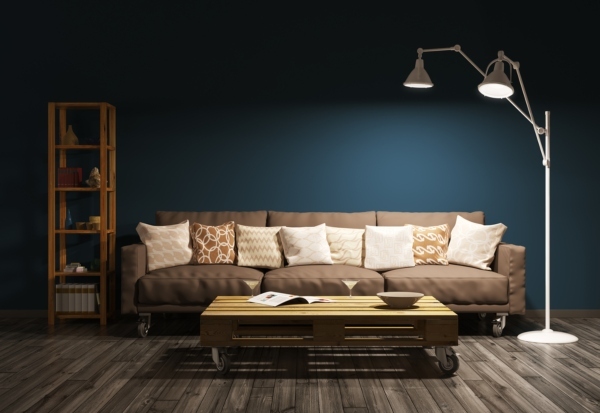 Look for low plug points for floor lamps, wall lighting at the right height above pictures, points for your entertainment centre, a lighting grid over your dining table and task lighting in your study areas. In the kitchen, do appliances like the dishwasher, microwave and OTG and mixer grinder have power points in the right places? Your washer-dryer also needs a power socket in the utility or laundry room. While you are getting the electrical points re-organised, you could take a look at the plumbing as well. Is the bathroom layout the way you want it? Would you like mixer taps or a diverter in your shower area? Will the flushing cistern for your water closet be a concealed one or a regular design? Take a look at the location of the kitchen sink, dishwasher and washing machine. Do you want a single or a double sink? Do you need a water outlet in your garden or garage? If the plumbing is not done the way you like it, then this is the time to get it redone. Any changes to the structure should be carried out before the rest of your interior is done. If your apartment or home has a central gas line, then the copper pipe for this will already be in place. However, if you are using a cylinder then its best to keep it in the utility rather than the main kitchen area, and you should get the copper pipe laid out behind your lower kitchen cabinets accordingly. At the same time, you can also get the core cutting done in the kitchen wall to take out the exhaust from the chimney. A hole of approximately 4 inches will be punched out of the top of the exterior wall at the point where the chimney exhaust pipe is to be taken outside, and this work can be a bit messy so it is better to get it out of the way. Note that the exhaust pipe itself will be laid only towards the end after your cabinets are fitted. If you are planning central Air Conditioning for several areas or split units in certain rooms, then this is the right time to talk to a consultant and place an order for the units. Central AC (which most people do not opt for in a house, by the way) requires careful planning and the provision of ducts and the AC unit. Split ACs will require some core cutting in the exterior wall to take out pipes. AC units may also need some re-organizing of electrical wiring, so this should be coordinated with the electrician. If you want to add drama to your ceilings, then a false ceiling is the way to go. This should be the next step in your interior planning. False ceilings are commonly made of Gypboard and Plaster of Paris, or wood. It can be designed according to your décor theme. A coved ceiling with strip lights that are concealed can add a touch of drama to any room. Remember that a false ceiling can neatly hide air conditioning ducts and electrical lines. Decorative ceilings like MyCeiling from Homelane are also a cost-saving option that is very quick to install, with minimal mess in the house! Lighting is inbuilt into the design, allowing for easy installation. While all the civil work outlined above has been happening, your designer will work with you to design your woodwork for all the rooms. This will include foyer storage, living room wall units and dividers, kitchen cabinets, bedroom storage, bathroom cabinets and so on. Loose furniture will also be considered. Make sure that you pick durable core materials, and textures and finishes that go with your themes for each space. Contemporary themes will typically use materials like glass, aluminium, glossy finishes and solid colours. Classical themes use a lot of natural wood and ornamentation in the detailing. Each item will be carefully designed keeping functionality and aesthetics in mind. 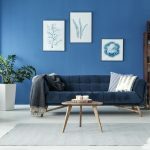 At this time you can place the order for any loose furniture that you wish to have such as dining table and chairs, sofas and settees that you wish to order off a catalogue or from a showroom. By planning ahead you can be sure that by the time your interior installation is ready, the items that you have ordered will also be ready to be shipped. It’s also time to work on your furnishings like the curtains, sofa upholstery, cushions, and rugs. As you shop around, do pick up artwork for the walls, table lamps, potted plants, small artefacts and more. The sky is the limit as to what you could add to accessorize your home the way you want it! Do make sure that you don’t clutter up the house, though, and keep the scale of your rooms in mind. You don’t want to pick up a sofa that is so bulky that it won’t fit through the front door! Also, make sure that you work with the colour palette you have chosen, and pick materials and textures that accentuate your theme. 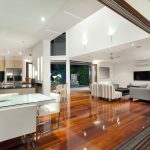 You may wish to have hard wood, wooden laminate floors or vitrified tile flooring installed in some areas, and this can now be laid over your existing floor. Wooden floors add warmth and feel nice underfoot in bedrooms, living and family areas. Vitrified flooring is the more sensible choice in areas where you will have a lot of spillages like kitchens, bathrooms and dining areas. Bathroom and kitchen floors should also not be slippery so non-skid tiles are a good pick. Keep durability, comfort, and cost as priorities when you are making your choices. Point to note: Once the flooring is installed, please remember to keep it covered while the rest of your installation is getting done. When furniture is moved around, it’s only too easy to get scratches on the floor. 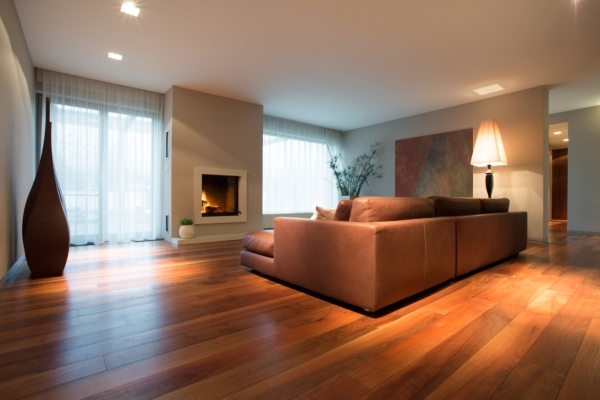 Laminate flooring cannot be re-polished like real wood, and you will have to live with those scratches for a long time! By now your woodwork will be ready for installation. Keep an eye on the finishes- the polishing of woodwork, finishing of paint and the fitting of accessories. 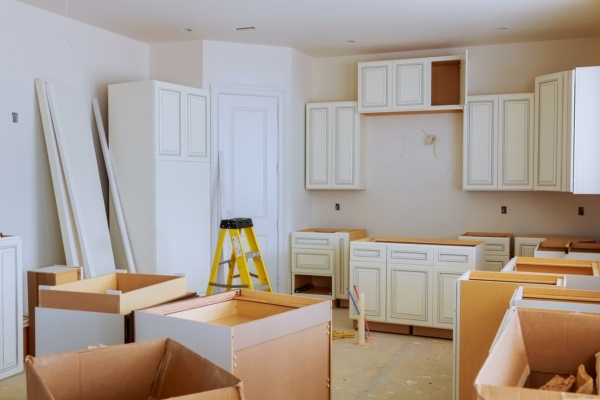 Your home is almost ready now! Once the fitted wardrobes and cabinets are done, you can give your walls the final coat of paint. In some spaces, an accent wall that is painted a different shade, or where textured paint is used, can lend an elegant look. 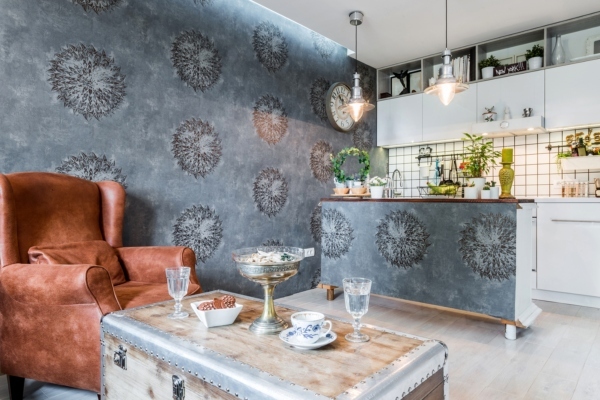 If you are wallpapering some areas, then your designer will help you choose the right designs that will match your décor. Some designers prefer to finish the painting before the woodwork is done; this is really up to you and your carpenters. And…you’ve reached the finish line. You can now heave a sigh of relief! Give yourself a pat on the back. If you have followed all these steps, then you have the interior of your dreams! We’re sure that your decorating journey was fun and worth all the hard work and effort!